New Sound Jazz Machine is the youngest and most talented bigband of Enschede. The band is a mix of professional and semi-professional musicians, with a unique and original mix of Jazz, Funk, Latin, Fusion and more. 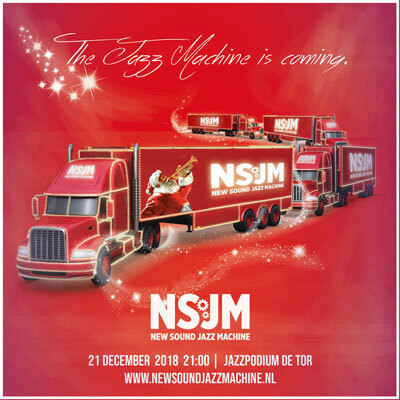 Upcoming and award-winning bass player, band leader and composer Joris Bolhaar writes all songs exclusively for NSJM, the New Sound Jazz Machine. NSJM plays a yearly Christmas program at Jazz podium de Tor in Enschede. A fun mix of Chorals, Jazz, Vocal songs and a suite of various latin, fusion and even some funk. Composer Joris Bolhaar is known for his creativity and one of the most talented and upcoming jazz composers of today. NSJM plays at Jazz podium de Tor in Enschede at least twice a year. See https://www.jazzpodiumdetor.nl/?s=new+sound+jazz+machine for reviews (Dutch).